This application provides a heat map to show an area’s “happiness” level and make marijuana legal in more countries. A man named Paulo Costa, from Brazil, has been using cannabis to help to control the seizures that are associated with his epilepsy, and is now using a geolocation based mobile app to help to spread “happiness” and encourage the decriminalization of cannabis use, particularly for medical purposes, in more countries around the world. The increasingly popular mobile app has been nicknamed “Foursquare for Stoners” in Brazil. That said, as playful as the tone of the tongue in cheek geolocation app may seem, and as much as it has been designed to be fun to use, it also has a more serious purpose, underneath. Costa has been using cannabis to help to control his seizures since he was first diagnosed with epilepsy at the age of 18 years. A growing body of reputable evidence has been suggesting that the promising results that Costa has been experiencing are not isolated to himself. Studies are showing that controlled use of medicinal marijuana can help to improve the quality of life of epilepsy patients. The idea for using geolocation in a mobile app came to Costa when he was hanging out with his friends in Brazil. 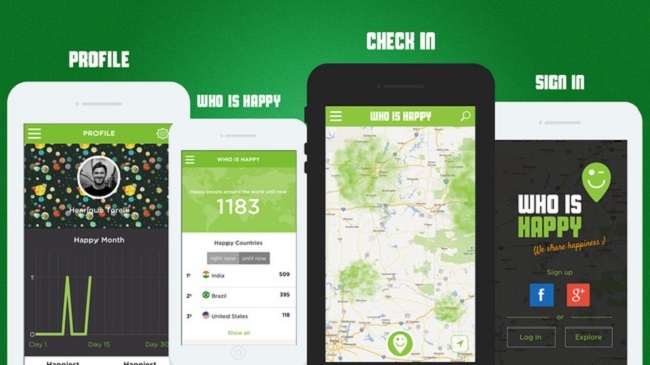 Together, they came up with the “Who is Happy” mobile app, which uses location based technology to create a heat map of cannabis users around the world that allows them to create a real time broadcast of their “happiness”. To use the mobile app, the idea is to simply tap the green “happiness” icon on the smartphone screen whenever cannabis is being used. This adds a haze of green smoke to a 1 kilometer radius around the current location of the individual on the map. This suggests that an application user is “happy” in that region of the world. By zooming out on the map, it becomes possible to see other local and more distant regions of the world where there are others who are “happy”. This allows for the collection of happiness stats. Of course, it is not just happiness that is being recorded through this geolocation app. The idea is to help to add to a broader effort to decriminalize the use of marijuana in countries around the world. It has already found itself among the top 30 app downloads in Brazil and is rapidly increasing in popularity worldwide.